Welcome to The Planetary Construction Project! Our Goal: To create a living breathing world from scratch using Earth's preexisting creatures with the eventual goal of hosting a series of activities within it's confines. Upon completion this world will be a fully realized system with flora and fauna, nations, governments, social ladders, economies, lore, and whatever else we want to add. But we'll get to that later. How we'll do it: In order to make this new world we will each design our own sections and post them. They will be reviewed and suggestions will be made by the other members of the crew. Once a portion of the world has been completed it will be added to the map. The planet will not be complete until every section of the map is filled and the nations within are detailed. Our map will be kept to scale with a very simple system. One pixel is one mile. We will be using a cylindrical representation of the world, laid flat the map will be a five thousand pixel by three thousand pixel rectangle. Members will request sections of the map in which they will draw their landforms on. You may select more than one section of the map if they'd like; however, you may not select two adjacent sections. As well, players are limited to one island square and they are first come, first serve. Finally, I want to repeat that we are going to be playing this game over multiple phases. 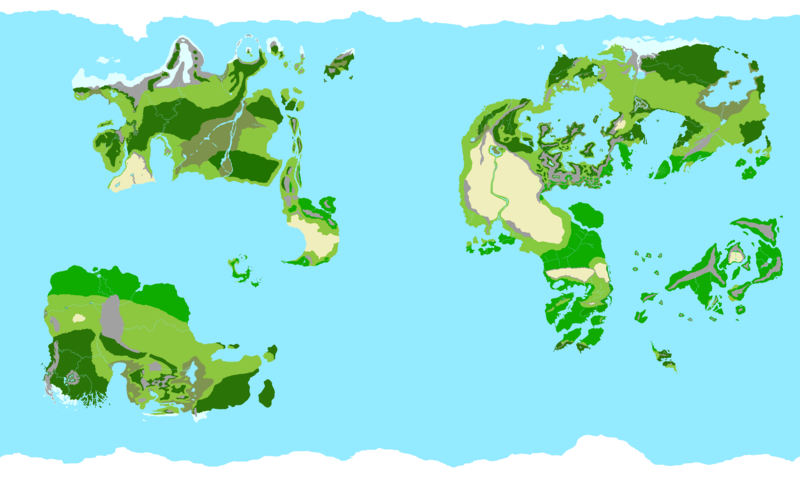 The first phase will be the LAND PHASE and during this phase we will ONLY be designing landmasses with whatever features you want. This phase should be fairly quick and then we will get to the NATION PHASE. This phase will see political lines drawn on our finished landforms. You may make a nation on the land you've designed, but players are encouraged to try to create nations on other landmasses, too. And remember, not everyone can make a Superpower. So be responsible! And when it's finished: The completed planet will make for the perfect canvas in which to base Role Playing games, Meta-Games, Diplomacy-type games, and more! Really we are designing a place in which we can play games and have fun, and turning the design process into a game itself. How do I join: If you'd like to help out just ask! It's really simple to join but be sure that you are able to satisfy the demands that this project presents. The demands (Rules): There will be some rules and requirements in place to make sure things go smoothly and they will be enforced. Respect the other players and give them constructive criticisms. Be reasonable with your creations, do not make anything that does not fit or throws off the balance of this world. It is meant to be a world that could really exist and a god-like race of humans that can kill with their minds would knock everything off kilter. This means that we must also consider things that may not be desirable. Every world has bad things, too. So will ours. You must maintain a certain level of professionalism as well as provide the project with quality work. This is not some project that will be thrown together, it is meant to be done properly and with care. The majority rules; if everyone else thinks your stuff stinks then they reserve the right to remove it. On that note, there is no one person in charge, we operate as a ruling body and made our decisions as a group. Welcome to the LAND PHASE! This part is really simple. Check the map and pick an allotment of land you'd like to use. Large squares are 500x500 and the smaller ones are 250x250. Remember, one pixel is one mile and you cannot select adjacent tiles. For the time being, start with one tile and try to spread out your selections because there's one important thing to remember... tiles that touch MUST contain land that also touches and there are no exceptions to this. Each color represents an entire continent. So that means if you've selected tile G1, its borders must reconcile with those of G2, G4, and G9. Stay on your toes! READ THIS: When you pick your tile all you have to do is go to Photoshop or whatever you're using (NO PAINT) and create a canvas of the corresponding size. Don't worry about the water for now, we want all land submissions drawn on a transparent canvas for easy transference. Save your 500x500 or 250x250 tile as a PNG image file and post it in this topic using imagur. This will preserve the transparency, retain the quality of your work, and imagur won't resize your file. From there, your file will simply be pasted onto the master map file and that's that. Very simple and very easy. But remember, you must save your image as a PNG. And super last final thing. If you want a land tile assigned to you at random, I can do that. It's no problem at all. And that's all! GO! Available: Aw ****! Nothing left. I wish to claim two tiles. I wish for them to be chosen at random. I'll take G10. Also, should we have some sort of standardized terrain colors? Oh, hello there! Welcome to the Nation Phase of the PCP! This is the phase of the game where be breathe some life into our lovely little world! We won't be including prehistory in this phase, as it would just be a retelling of human history. Instead, we're going to start off with the first semblance of civilization. And to do that, we're going to be breaking the players up into groups! This will be done randomly and cooperation is key! But before the groups are made we need to discuss how Nation Phase works and where it will begin. Nation Phase is split up into four distinct eras: Dawn of Civilization, Antiquity*, Expansion*, Industrialization*, and Futopia! Each of these eras will be divided into two sub-segments to allow for some semblance of change within the age itself. Basically we get two snapshots of each era. Additionally, the Antiquity, Expansion, and Industrialization eras will have a special vote half-way through during which the players will select their favorite civilization story up to that point. All good things must come to an end, and the civilization with the fewest votes will melt away into the annals of history. The groups will shift slightly and the next round will begin. Whichever group is selected to dissolve their civilization may, if they choose, write the fantastic tale of their civilization's demise. PLEASE NOTE! If a group wishes to voluntarily dissolve their civilization at ANY POINT, they may. Should this happen during a voting round, the vote will be called off. And hey, remember, you can't vote for your own group. Your era "snapshots" will consist of a written account of your civilization's status, culture, issues, and achievements. Groups are also encouraged to make marks on the map! Everyone will have access to a blank copy of the map and each group may submit (reasonable) changes to the map to be incorporated into the official version. Civs can be placed anywhere you'd like. You may order your group however you wish. Maybe you want to all oversee one nation, or perhaps you'd like to give each person a territory to work on. It's entirely up to you and your group! Heck, if you'd like to make multiple nations you can! But be cautioned that you should be responsible with this. Don't use it unfairly. As far as group breakdowns are concerned, we will have four groups. These groups are tasked with making our civilizations and whatnot. If we need to, we'll assemble the team of judges to solve problems happening in-game. Your judges are Clarke, Jos, and Munchkin, Neoadept, and Tesla. Their decisions are final. So if you get in a dispute about a war between civilizations and they come in with a decision, you must accept it. If anyone has further questions, please feel free to ask! For now, let's take a brief look at what each era consists of. Dawn of Civilization: This era marks the first large-scale settlements on our humble planet. People have developed basic farming techniques and rudimentary ways of spreading their culture. And now they've hit upon the ultimate display of their group's power: the city. This era sees your centuries of development culminate with large urban centers of trade, culture, and politics. Groups are limited to TWO civs during this phase. Antiquity: Your cities stand tall and you've even managed to meet some other cultures! But your growth is no longer limited to the physical space. Your people have begun exploring the depths of the human mind and radical new technologies are being discovered on a regular basis. Nothing fantastic (at least by our future-man perspective), but life is steadily getting easier and more worthwhile. Groups are limited to FOUR civs during this phase. Expansion: The land your ancestors toiled over for all of written history has been conquered and divvied up. Civilizations have risen to astronomical heights while others have fallen into obscurity. Whatever perspectives people had about the world have begun to change and there are some that believe there's more out there than what we can see. The time has come to explore the unknown and discover its treasures and terrors. Groups are limited to FIVE civs during this phase. Industrialization: Who would have thought that one day a single man would be able to produce more fabric in a single day than your entire civilization had up to that point? Machines have been created to aid our ever-expanding civilizations and to subjugate those that oppose us. Electric lights twinkle in windows all across the world and somewhere someone is perfecting a way to communicate across vast distances instantaneously. Truly we are in an age of wonders! Groups are limited to THREE civs during this phase. Futopia! : Some people may ask what a Futopia is. And to those people, I respond with a simple question: you tell me! The future is yours to write. Groups are limited to TWO civs during this phase. And there you go! Thanks Raz. Putting this in the first post. Remember not to use brushes, only hard, pencil-style. If you use brushes, you'll screw up the map. Alrighty, threw up my section, knowing that I'll probably have to redo something. Right now I'm just going to bed. We decided to tweak the colors a bit. 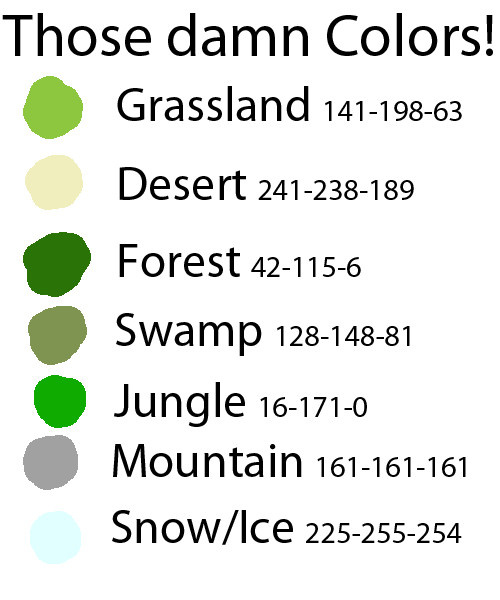 Here is the final color chart. Hmm, I think we should probably leave black borders out. They don't add any information to the map; it's essentially just wasted space. Yaaay! Working all the kinks out. I remember staying up all night during the first phase of PCP1, too. Yeah black borders should probably be ignored until we get to the NATION PHASE. 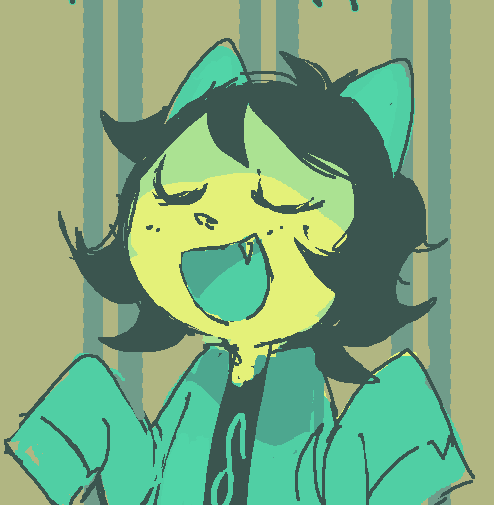 Stick to the new colors (sorry Jos!!!) and if you do have a neighbor, try to coordinate where the plots of land meet up as best you can. AND REMEMBER, YOU DON'T NEED TO COLOR WATER. Whether it's sea water or inland water, just leave it blank and we'll uniformly take care of it in post-processing.